Not known for their high R-values, masonry materials, are not thought of as good insulators. Masonry materials do, however, have thermal mass, the ability to store heat and release it later. As such, mass masonry wall systems have better energy performance than light-framed wall systems of equal thermal conductivity. This quality provides a great benefit by maintaining occupant comfort levels and lowering energy and equipment costs over the life of the building. Building energy codes recognize these benefits by requiring less insulation in mass walls to achieve the same performance as other walls, even in colder climate zones (CZ). Mass walls that include masonry or concrete have higher maximum overall wall U-factors allowed by code than light-framed walls of wood or steel stud . Mass materials store heat, which reduces the total heat flow through walls in real weather conditions. Mass on inside wall surfaces also helps maintain inside air temperatures for a more comfortable indoor environment. International Energy Commercial Code (IECC) addresses energy efficiency directly through reduced energy usage, but indirectly affects cost savings, conservation of natural resources and the impact of energy usage on the environment. The 2012 and 2015 IECC energy codes have specific insulation requirements for each climate zone, which they list in prescriptive tables of minimum R-values for thermal resistance (Table C402.2 in 2012 IECC and C402.1.3 in 2015 IECC) and maximum U-factors for thermal transmittance (Table C402.1.2 in 2012 IECC and C402.1.4 in 2015 IECC). The higher the R-value, the greater a material’s resistance to conductive heat transfer and the higher its insulating properties, and the higher the U-factor, the greater a wall’s resistance to heat flow and the better its insulating properties. R-value requirements for walls are the same in both codes, with minor differences in U-factor requirements. Normally, thermal resistance is the inverse of thermal conductivity, or R = 1/U. But the IECC tables do not reflect this, because the R-value table specifically identifies the continuous insulation element within the wall, whereas the U-factor table lists thermal conductivity requirements for the wall system. Because of this, the U-factor method may be a more accurate measure of thermal performance of the whole building envelope. This article demonstrates how to calculate the U-factor of a wall system and lists actual U-factors and R-values for many popular wall systems. These tables compare the performance of different wall systems identifying the proper amount of insulation to meet the energy codes for each climate zone. Using the U-factor table has another advantage. The Department of Energy’s (DoE) COMcheck program simplifies compliance for designers and building officials, among others by allowing them to quickly determine if a building project’s envelope meets IECC requirements. COMcheck allows area-weighted averaging of all of the thermal envelope components to calculate overall heat loss through the entire envelope. This is not possible using the R-value tables. For example, if a single-wythe concrete masonry wall with R5.7 (U 0.175) has 20% of the heat loss for a building, and fenestration U-factors are slightly better than required, the lower U-factors of the windows can be used to offset the higher U-factors of the walls. Also it may be relatively inexpensive to increase the thickness of roof insulation to offset higher U-factors in walls. COMcheck will calculate these offsets and return a unity check value that is greater than or equal to one if the building meets or exceeds IECC requirements. 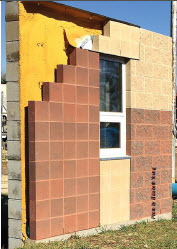 One result of the more stringent requirements in IECC 2012 and 2015 (requiring energy efficient performance about 30% better than the 2009 IECC) is that some designers in colder climate zones are increasing the masonry cavity beyond the 4.5" allowed in the 2013 masonry code (TMS 402-2013). This requires rational design by a qualified design professional. Major masonry veneer anchor manufacturers have designed anchors that will span larger veneer cavities up to 6.625". TMS 402- 2016 has been revised to allow a total masonry cavity of 6.625". Referring to this updated version of the masonry code is another path to acceptance of wider veneer cavities. There is a lot of confusion about the thermal performance of walls. Some of that confusion results from the way individual product R-values are determined and the assumption that R-value transfers directly to performance. For example, batt insulation manufacturers publish R-values for their products as tested in a steady-state environment. The R-value of batt insulation placed within a stud cavity does not account for the heat loss through the wood or metal framing in the wall. Overall R-value for the wall will be much less than the R-value of the insulation. Also, air gaps and cavities in placed batt insulation caused by imperfect installation and/or by wiring and other utilities within the stud cavities that increase heat flow and further reduce the effective R-value of the wall system. ASHRAE has published reduction coefficients that allow us to better estimate the actual R-value of framed walls. These are reflected in IECC Table C402.1.4.1. R = 1 / U 0.154 = R6.5 or about half the R value of perfectly placed insulation. If low density spray foam or sprayed cellulose is used in place of fiberglass batt, the R-value of the stud and insulation layer is R7.75 (U 0.129). This is easier to calculate accurately because once installed, sprayed insulation does not shift or create air gaps. If 2x6 framing @ 24" oc is used instead of 2x4 framing, the R-value of the wood stud layer becomes R11 to R13 for the stud layer, but nowhere near the R19 of 6" batt insulation by itself. For walls with 6" steel stud at 16 and R19 batt insulation between the stud, the effective R-value of the steel stud layer, is ER7.03 (U 0.142), using ASHRAE reduction factors in IECC Table C402.1.4.1. 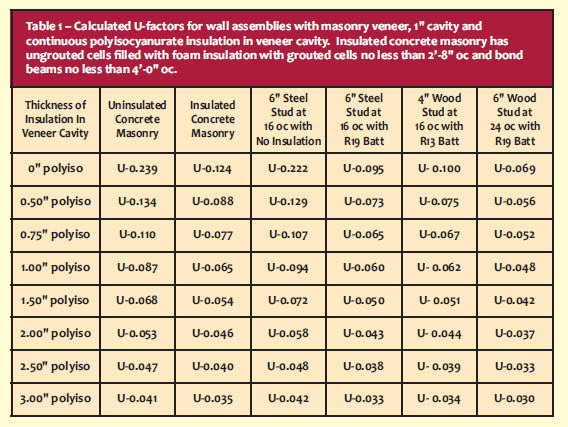 R-values and U-factors of popular framed and concrete masonry wall systems are calculated and listed as U-factors in Table 1 with different thicknesses of continuous polyisocyanurate board insulation. These values include all continuous and discontinuous layers within the wall, as well as inside and outside air boundary layers. 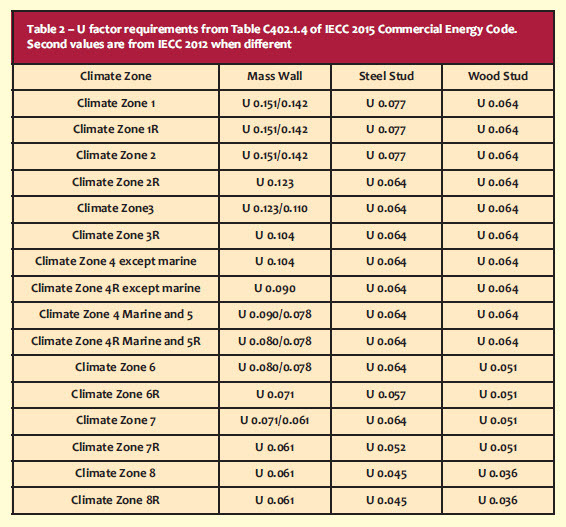 Table 2 lists the IECC 2015 maximum U-factors for each climate zone and group. The tables include wall systems that meet IECC 2015 requirements for any climate zone with any masonry veneer or cavity wall system using the prescriptive maximum U-factors in Table C402.1.4. Foil-faced polyisocyanurate insulation board is used because of its higher aged R-value of R6.5/". In all of these wall systems, code can be achieved with 3" or less of insulation, depending on type and R-value. For example, 3" of one type of polyiso has an R-value of 20.3, while 3" of an extruded polystyrene insulation provides R15. Masonry walls require less insulation to meet IECC requirements because of their ability to store and release heat. A masonry cavity wall with brick veneer with 8" uninsulated concrete masonry and 2" polyisocyanurate cavity insulation meets IECC prescriptive requirements in all climate zones. The same wall with 1" cavity insulation works for CZ 1 through 5, except group R.
For Chicago (CZ 5 and 5R) many designers leave steel stud cavities uninsulated to avoid condensation. IECC requires a maximum U-0.64. This assembly with 2" of polyiso is U 0.58, which easily meets this requirement. It also works for all of CZ 6 and 7, except group R.
If steel stud cavities are insulated, only 1" of polyiso is required for CZ 1 through 6 and 7 except group R. IECC 2012 requires ½"more insulation for CZ 6. Batt insulated steel stud walls with 2" polyiso meet IECC requirements for both codes in all climate zones. Steel stud walls without batt insulation and 3" polyiso also meet IECC requirements in all climate zones. 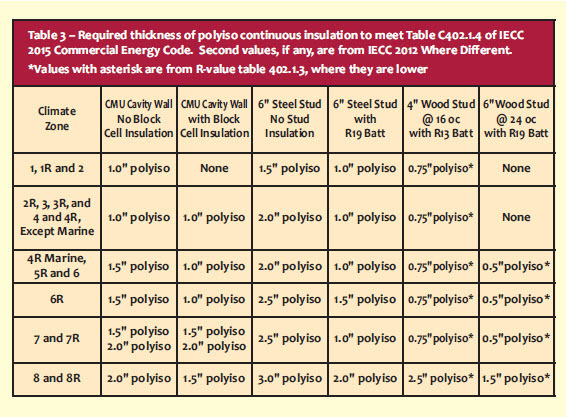 2x4 wood stud at 16" oc with R13 batt insulation require 3/4" polyiso for CZ 1 through 5. 2x6 wood stud at 24" oc with R19 batt and 1" polyiso is a design choice for CZ 6 through 7R. 2x6 wood stud at 24" oc with R19 batt and 2.5" polyiso meets IECC requirements for Fairbanks, AK, which is the coldest major city in the world (C Z8 and 8R). Note that the requirement for continuous insulation means that corrugated strip ties cannot be used, since they are limited to a 1" cavity. The R-value tables in both IECC 2012 and 2015 require approximately 1" less continuous insulation than calculated using the U-factor tables. These lesser values are included in Table 3 with an asterisk to indicate that they were taken from those tables. These values meet code requirements, but designers with a concern for better energy performance may wish to use more continuous insulation calculated using U-factors, to achieve performance comparable to other wall systems. Unlike building code created to provide minimum standards to protect life safety of building occupants, 2012 and 2015 energy codes have high performance expectations, significantly raising the bar over prior versions. Most single-wythe masonry walls have higher U-factors, because of thermal bridging through block webs and grouted cells. IECC recognizes a presumed R 5.7* (U 0.176) for 8" concrete masonry that is lightly reinforced with grouted cell no less than 2'-8" oc and bond beams no closer than 4'-0" oc. That exceeds the maximum prescriptive U-factor for all climate zones. But Equation 4-2 allows area-weighted averaging, where total energy loss through other building envelope components can be adjusted to compensate for increased U-factors of the walls. For example, window area can be reduced below the specified maximum and additional roof and perimeter slab insulation can be used to assure that overall heat gain or loss is less than or equal to an equivalent building that meets all U, F, C and D requirements. The tradeoff method of pass/fail compliance with COMcheck is useful for single-wythe design. Whole building energy analysis can also be used to meet IECC requirements for single-wythe concrete masonry. In addition to framing and insulation, wall systems are increasingly becoming complex as they, in turn, become more efficient. Building science has provided much insight into both how air and water move through a building envelope, but also how that transference affects performance, including where a dew point falls within the wall, which may or may not lead to deterioration of certain wall components. This means the addition of air/vapor/moisture barriers to building codes. Further research into combustibility, fire spread, sound transmission and more may require additional materials added to wall systems (adding to the bottom line cost of a system). Masonry, however, has many inherent attributes that often reduce the number of add-ons that may be required of a wood- or steel-framed structure. Aminoplast foam can be injected into brick veneer cavities of existing buildings to provide continuous insulation in the veneer cavity and improve thermal performance. Aminoplast is a water-based foam that fills the cavity under low pressure injection and does not bond to the wall materials. It has been used for many years to insulate open cells in concrete masonry walls. Since it does not bond, it allows drainage to the weep system, as it does in the cells of concrete masonry walls. Cured R-value is approximately R4.6/". There are many possible approaches to designing buildings to meet the 2012 and 2015 IECC. Many designers are simply using the prescriptive R-value tables, which often require more continuous insulation and thicker walls than would be required using the prescriptive U-factor tables. Using U-factors requires more calculations to determine the composite R-value and Ufactor of the complete wall system, but many of those calculations are provided here and summarized in the tables for the designer’s convenience. Ongoing research of wall system components and overall energy performance contributes to better understanding of the performance of masonry walls and veneer systems, resulting in the design of more economical and energy efficient walls, with savings in both construction costs and floor space.